Experience Canada’s two best attractions in one incredible action packed day! Visit Niagara Falls one of the spectacular natural wonders of the world and view the must-see historic landmarks of Toronto. Unforgettable activities include a winery visit sampling Ontario’s world renowned wines and Ice wines, lunch at a Niagara Falls, comprehensive Toronto sightseeing and an enigmatic cruise along Toronto’s waterfront that captures the city’s romantic skyline. Along the course of this mega tour have plenty of time for photo opportunities to take memories back with you! Brimming with adventure, thrills and excitement discover Canada's greatest natural phenomena and historic landmarks of its most vibrant metropolis. This tantalizing tour commences with pick up from downtown Toronto where you are welcomed by our professional guide. 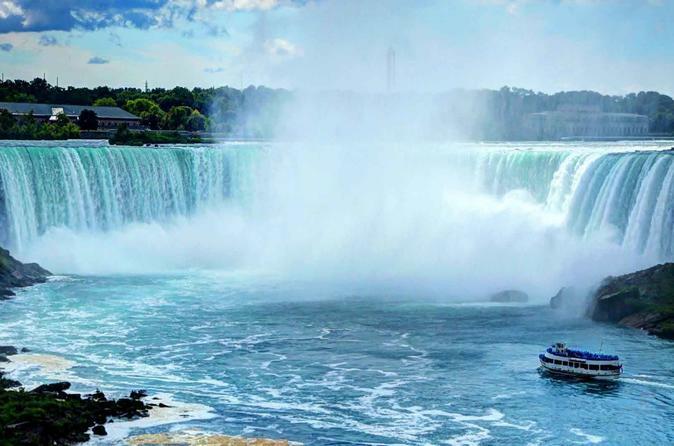 Depart for Niagara Falls uncovering interesting facts from your guide about Canada’s greatest natural attraction. Receive time to explore and marvel Niagara Falls, or get up close and personal to the waterfalls with our cruise package. Next, we head over to a Premium Vineyard; an evocative sprawling winery encompassing heritage buildings where you get the best of old world charm and new world winemaking. Stop en-route to check-out one of the largest floral clocks in the world. Have the opportunity to sample a selection of Ontario wine and Ice-wine whilst learning about the wine production process by wine experts. Arriving back in Toronto’s Habourfront relax on sightseeing cruise of Lake Ontario viewing its beautiful islands and the city’s most vital harbor whilst keeping the city’s iconic skyline as your backdrop. Proceed thereafter with a panoramic city tour of Toronto landmarks that include the Rogers Centre, Air Canada Centre, CN Tower, AGO, ROM, Hockey Hall of Fame, City Hall, and the historic Distillery District to conclude this incredible day of Canadian exploration. Return to your hotel having forged memories of a lifetime.